Apple's "It's Show Time" event will kick off shortly at the Steve Jobs Theater in Cupertino, California. The event will see the unveiling of Apple's long-rumored streaming TV service as well as its updated and enhanced Apple News subscription platform. Other potential talking points from the company include additions to Apple Pay and a new gaming service. To be sure that you don't miss any part of the event, we've put together this helpful guide to outline when it takes place and where you can watch it streaming online. Of course, you can expect MacRumors to provide full live coverage of today's event as well. Watch on web (video): Head to Apple's Events page and stream the event directly from your laptop, desktop, smartphone, or tablet (streaming now supports Firefox and Chrome). Watch on web (live blog): If you're busy at work or school, you'll be able to rely on MacRumors' live coverage for up-to-the-minute updates from the event by keeping our event live blog open in a nearby window. Watch on Twitter: You can also follow our @MacRumorsLive Twitter account. 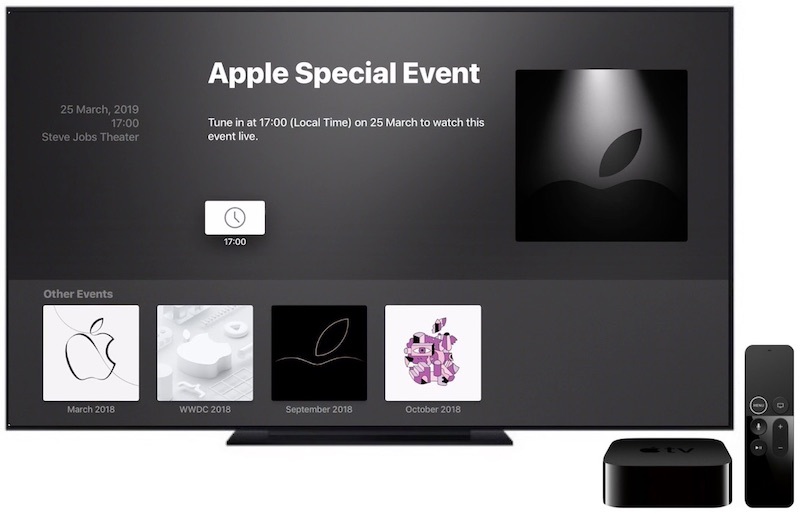 Watch on TV: For anyone at home or near an Apple TV, the Apple Events tvOS app is the best way to watch these events on a big screen. You can use the Siri Remote to voice search "Apple Events app" on the tvOS App Store. Watch later without spoilers: If you want to avoid spoilers from the event, check out our spoiler-free article where you can find out when Apple's video replay goes live. Otherwise, we will be posting regularly throughout the event, and you'll be able to find those updates on our front page and our regular @MacRumors Twitter account. For more information on what to expect from Apple today, be sure to read our full event preview. Historically... it exists because Apple wouldn't live video stream. So people didn't watch to watch on a live blog, and instead watch the real video. Today? with Live streaming from Apple? It's less useful... unless you can't watch at work or something.